The French National Paralympic Committee (NPC) Secretary General is out of office this week and working remotely – from the shooting range. Tanguy de la Forest has put his duties with the NPC – also known as the Comite Paralympique et Sportif Francais (CPSF) – on hold to compete at his home World Shooting Para Sport World Cup in Chateauroux, which got underway on Monday (24 September). It might seem like a lot to juggle for the four-time Paralympian, but his ability to focus is perfect for a shooting sport athlete. “I have to prioritise my actions according to the deadlines,” he explained. Chateauroux 2018 will be de la Forest’s first major competition since the World Championships in May, and also an important qualifying opportunity for the Tokyo 2020 Paralympics; de la Forest wants to secure a slot for France, which he hopes can be his later. At the 2016 Paralympics, de la Forest fell short of medalling in the R4 (mixed 10m air rifle standing SH2) and R5 (mixed 10m air rifle prone SH2). 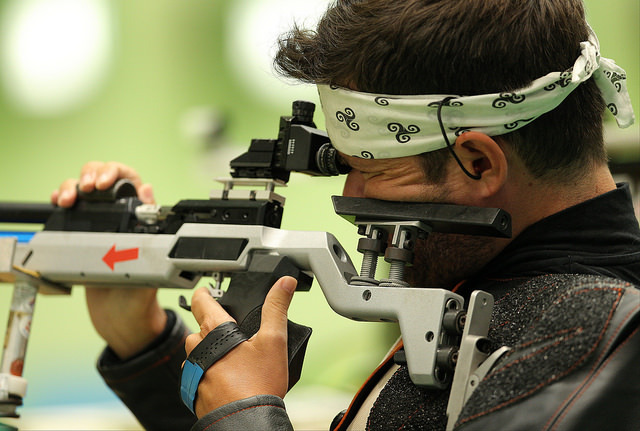 In Chateauroux, he will compete in both events, plus the R9 (mixed 50m rifle prone SH2). “When I compete for France, I go above and beyond and give 100 per cent to get the best results,” he said. Since the 2018 Worlds, de la Forest resumed his training programme in August with camps and particularly focused on the 50m course. “As well as working on my technique, I am also working on my mental preparation in order to be ready on the day,” he explained. The mental preparation helps him to focus on his own performance instead of being distracted by other competitors. Outside of competition, de la Forest focuses his energies on the operations of the CPSF, as well as being involved in two different businesses. “I was elected and appointed to this position [Secretary General] with the main missions of supporting our sporting delegations to the Games, supporting the member federations to develop disability sport, and making the [Paralympic Movement] shine in France,” de la Forest said. This week’s World Cup runs until 29 September and is held in the newly build National Shooting Centre of France, which opened this year. “[It] is a good opportunity because we have recently been able to access an incredible shooting range on which Team France can train,” de la Forest said. The Chateauroux World Cup will be livestreamed from Tuesday (25 September) on World Shooting Para Sport website and Facebook page.